Hello again. After being out of S gauge for about 14 years, I am digging into my collection and getting things running again. I bought the new Northern 6-48047 when Lionel introduced it, but have not run it until now. Boy, what a set of disappointments, one after another. Anyway, the loco has one of the new E-units that Lionel developed for starter sets. It's the long narrow one with the slot in the board that usually accepts the mono heat sink. The loco seems to run OK by itself, if you can ignore the loud squeak from the puffer, but the problem is that it has no high speed. Low speed performance is poor, to say the least, but even with 18 volts on the track, the loco hardly gets out of its own way and has very poor pulling power, especially for what it should have with that nice can motor in it. I looked at motor binding and lubrication issues and there seems to be none. Upon disconnecting the E-unit and running the motor on straight DC, it runs fast and strong, like it should. So my question is... does the starter set E-unit have some sort of speed reduction built into it? Do these E-units go bad in such a way as to cause the motor to run slower than full speed? Is there a resistor value fix or anything of that nature for these E-units? I know I can get out my old o-scope and poke around, but someone must know the answer here. Thanks in advance for any help you can give. This loco is a dog right now, but it seems like it shouldn't have to be. I had a similar issue with the Milwaukee Road Northern I have, it ran fine for a few years and then had a hard time pulling a string of 8 cars. It had to go back to Lionel, and the explanation I got was that power from the track was bleeding off to something else in the locomotive and the motor was not getting antiquate power. It might have been the smoke unit, as it smoked like CRAZY even though it was running slow. It came back fixed, and I have not had a problem since. Lionel also had/has a fix for the squeak from the smoke unit if you call them. It seems to be the E-unit. It does not change speed either with the smoke unit engaged or disengaged. The motor runs faster with a Williams E-unit hooked up (and the Lionel one disconnected) and does not slow down when the smoke unit is engaged and powered up. Unfortunately, the Williams E-unit will not fit into the boiler. I might be able to make a Dallee E-unit fit, or maybe I can buy a new Lionel E-unit that will work properly. Unfortunately, the E-unit is $35 on the Lionel site. There may be a worm gear clearence issue? Carl, I looked at that. It does not seem to be binding, but I could not get one of the motor mount screws out. I also do not understand how tilting the motor will help, since it is between the drive gear and the gear for the smoke piston. As additional information, I have been cycling the chassis on my work bench. Many times it will run fine/fast (but not as fast as with the Williams E-unit) but many times it will start up slowly and continue to run slowly. Some of the triacs are hot, but cooling them with circuit freeze spray does not affect their operation. If this thing had relays in it, I would suspect occasional poor contact at the points, but I am stumped. It definitely seems to be the E-unit. I'm eying a similar one removed from a Burlington FT a few years ago. Well replacing the E-unit may be the next thing to try. Well, the resolution may be close at hand, but maybe I can answer some of those questions. Some folks like to fix things and actually take pride in repairing something that is broken. I am one of those folks. Some folks do not like the hassle of sending something back. In addition to the time and energy involved, there is also the possibility of damage incurred in transit, or at least the wear and tear on the box. I am one of those folks. I have also seen things come back in worse condition than when I sent them in. There is always some risk in allowing someone else to take apart your toy and put it back together again. Another company took one of my scale mikados completely apart, then apparently had an apprentice put it back together again - bassackwards. And all it needed was a motor driver board, but it came back with all the rods on wrong. Thirdly, some folks feel that things are not black and white, but rather are shades of grey. In this particular case I have owned the loco for several years (whenever they came out, I cannot remember) but had only test run it. It was idle in it's box for years. The passage of time has some effect on the manufacturer's warranty policy. Should they warranty new old stock items as well as new in the box items? If I had run the loco when I got it, like most folks would, the problems would have appeared early on. That's when problems appear, either immediately or shortly after that. Usually, if a locomotive survives it's infancy, it will live a long life. From my standpoint, maybe I hadn't tested it enough. But I just got an email from Jon Z, offering a solution. You can't beat that for service. I assumed it was out of warrenty. To me reparing and tweaking is part of the hobby so it does not borther me so much. I can always improve almost any loco. But the "no worm gear backlash" is a common problem with some of these locos. It is easy to check by trying to rotate the rear driver by hand. There should be a bit of slop in the gears. It it feels tight then there is the problem. You only need to remove a few thousanths to get the clearences right. The worm needs to be centered between the smoke and axle worms gears. I checked it again, several times. Turning/rocking/rotating the rear drive wheel, there a slight play in the engagement with the worm, which is not just the play in the axle bushings although that seems a bit too much. Lionel has made a number of Flyer locos with so much play in the axle bushings that they seem "pre-worn out" to me, but I digress. Turning/rocking/rotating the gear that drives the puffer piston, there is a similar slight play in the worm engagement. 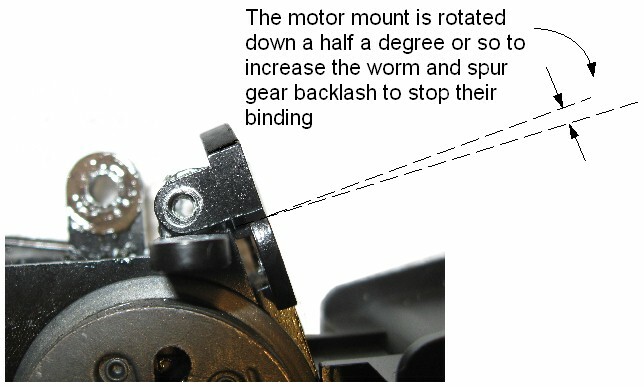 The motor worm is not binding on either gear.Neither is the worm/motor shaft bent, as there is no binding in the mechanism felt while rotating the flywheel by hand. The factory made this one correctly, at least in the mechanical respect. It stands to reason that even if the manufacturing tolerances are not held tightly/closely enough, at least some of the locos have to go through the manufacturing process with the motor in the right place with regards to the other gears. I am going to run it a bit at the mall tomorrow, then go on vacation and not think about it until after/during the TTOS convention here in town. After the convention, I will go to Lionel and get another reverse unit board and see if the loco's speed improves. So there won't be any progress to report for a few weeks, but I thank everyone for all the help so far.